Here I am, sitting at my computer on the first day of summer. I should be happy and I am. But, I am also envious of all the people who are able to attend the special concert, Bringing Broadway Home. 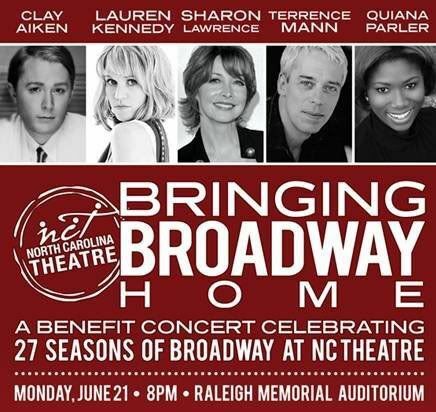 The concert, a fundraiser for The North Carolina Theater will star Clay Aiken, Lauren Kennedy, Sharon Lawrence, Terrence Mann and Quiana Parler. Each star has a history with the theater and is hoping to raise money for the theater group. For Clay Aiken fans, this is the opportunity to hear him sing songs that we have not heard he sing before. He has said that he will sing two songs from his new CD, Tried & True, but, but since all the songs will be from Broadway, he will be performing other songs too. Clay has been active in promoting this concert. He has given many interviews on both regional radio and television to encourage people to attend the concert. I hope that those who are lucky enough to attend will give us some great reports of the concert and the fun they had. I also hope that the concert brings much needed funds to the North Carolina Theatre. Today is The Summer Solstice It’s the longest day of the year. The amount of daylight only goes down from here for the next six months. 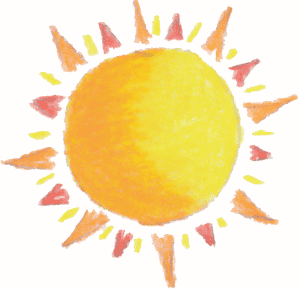 Summer Solstice is the meteorological start of summer. It’s time to enjoy vacations, great weather, pools, baseballs, and everything else that goes along with the favorite season of kids and most adults. Grab your favorite beverage and enjoy the season, because for many of us it is all too short. The Summer Solstice has been a very special time of year for many cultures through history. People have built monuments dedicated to the solstice and tracking the sun and stars. Stonehenge in England and Machu Picchu in Peru are both believed to be such monuments. Midsummer has long been believed to be special for falling in love and getting married, and herbs and flowers harvested on Midsummer Day were thought to have magical qualities, like making people invisible. Did you know? The sun does not set at the North Pole today. There is 24 hours of sunlight. Does it make up for that cold day in December when the sun does not rise above the horizon? No, but on this day it sure does feel good wherever you are! I hope to get some great reports from those who can go too. It sounds it should be a fun event for a great cause! The days get shorter now? Uggghh. I'll pretend I didn't read that and get reminded of it. Summer just started! Looking forward to this tonight. I'll do my best to report if I can get past looking at him all night. So excited for the show tonight. Hoping we will get some good clack. Hey, I think the Summer Solstice has been here in Florida since June l…geesh..it is so hot and humid here. Of course, that's just par for the course. Will be anxiously waiting for some clack from tonight. Cannot wait to hear what all Clay will be singing. Praying for audio and video of this. I'm listening on the cellstream and everyone sounds great. Error: Error validating access token: Session has expired on Tuesday, 21-Aug-18 16:13:01 PDT. The current time is Tuesday, 23-Apr-19 17:17:55 PDT.